Spring is finally in the air, which means the dark days of winter are coming to a close and a brand new season of interior trends is upon us! Spring is a particularly fun season in the world of interior design because it typically lends itself to bolder colors, more vibrant patterns, and generally more playful looks than its seasonal counterparts. And, fortunately for us all, this year is definitely no exception. From trends that’ll give your home a more relaxing and casual-chic feel to those that will infuse it with all the tropical paradise vibes, this season’s trends are all about uplifting your home with a cheerful, happy-making feel. The wabi-sabi trend has been quietly making its way into the interior trend scene for a while, but this spring you should expect it to be out in full force. If you’re wondering what the heck wabi-sabi is, just check out this apartment from My Daily Magazine. It’s essentially an aesthetic that finds beauty in imperfection. Think comfortably unmade beds, authentic artisanal accents like handmade ceramics, and generally letting go of a type-A style sensibility while embracing life’s beautiful flaws. We can already feel ourselves exhaling from the possibilities. Sleek silhouettes and geometric lines have had their moment; now it’s time for the soft and inviting feel of rounded furniture to take its turn, as showcased by Kate Arends on Instagram. This season, furniture far and wide is getting the curved treatment, with oversized ottomans in lieu of coffee tables, plush rounded couches, and curvy mid-century armchairs making homes much more comfortable and inviting. The herringbone pattern that’s traditionally used for wood floors is getting a seasonal update in the form of, well, everything else. This lively pattern no longer needs to be reserved for your floor as seen on The Stylist Splash. Everything from small decor accents to entire walls are being elevated by herringbone. And this trend looks especially fresh when it’s paired with bold spring colors, like vibrant teal and bright berry. Don’t have the resources to embark on a tropical getaway whenever you want? 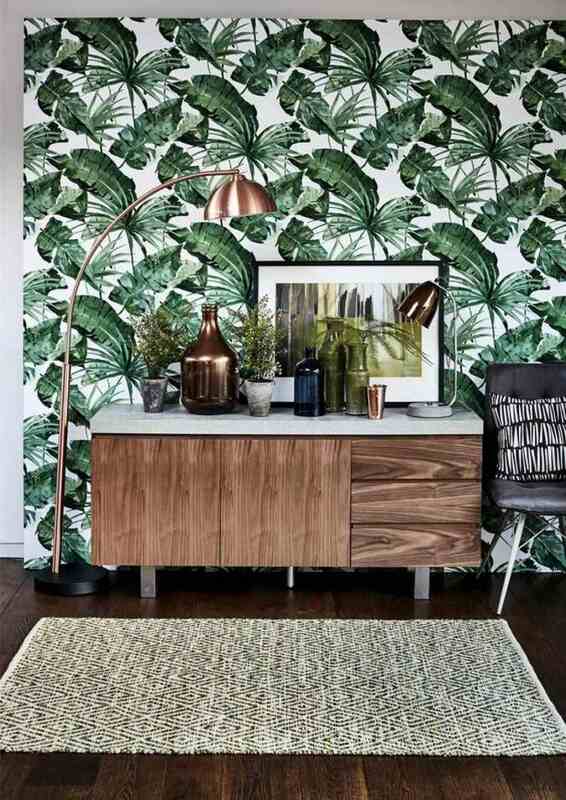 Then bring paradise right into your home with the springtime tropical print trend, as seen on Barker and Stonehouse. Green leafy botanicals, hot pink florals, and pretty much any other tropical print you can think of are making their way onto walls, throws and artwork this season, and homes are a whole lot happier for it. These patterns are particularly good as statement pieces as they'll instantly add life to your look. We’re not saying that chrome and copper finishes are out, but we are saying that brass finishes are all the way in. And they're bringing new hints of gilded glamor to homes everywhere. Brass is a surprisingly versatile material that can enhance virtually any aesthetic, as shown on Barker and Stonehouse. Plus, it features different finishes, like vintage, brushed and ultra-shiny, so you can experiment with different looks. Whether you try it as cabinetry hardware in the kitchen or opt for brass sinks in the bathroom, your home will instantly feel a little more glam. This laid back feel created by Keely Mann features the wabi-sabi trend and the tropical print trend perfectly, as they pave the way for the natural accents that are bringing the inviting feel of the outdoors inside. Organic materials have a unique way of bringing welcoming, homespun warmth into the home, and they’re a cinch to integrate. Everything from natural wood cabinetry to concrete vases to leather drawer pulls work wonders to elevate a home with inviting warmth and sophisticated style. It seems that office spaces are finally catching on to the idea that when we surround ourselves by bold, creative items, then we’re more bold and creative in return. This season is closing the door on stuffy and sterile offices in favor of playful prints, motivational messaging, and creative, personality-infused accents. So, rather than reserve the most colorful parts of your personality for outside of work, take notes from The Cow Spot and bring them into the office and watch how much more creative and energized you feel. This classic combination of black and white by I Spy DIY is making major waves this season and we’re all the way here for it. The beauty of this combo is that, in addition to being trendy it’s also timeless. That means you can apply it with delightful abandon without fear that it’ll look stale and outdated in a few months’ time.